Lake MerriweatherAttention anglers! The water level at Lake Merriweather often fluctuates. Goshen Scout Reservation staff draw down the lake during flood events and in the winter for shoreline maintenance. For the most up to date lake conditions call 251-230-5538 or follow Goshen Scout Reservation Hunt and Fish on Facebook. 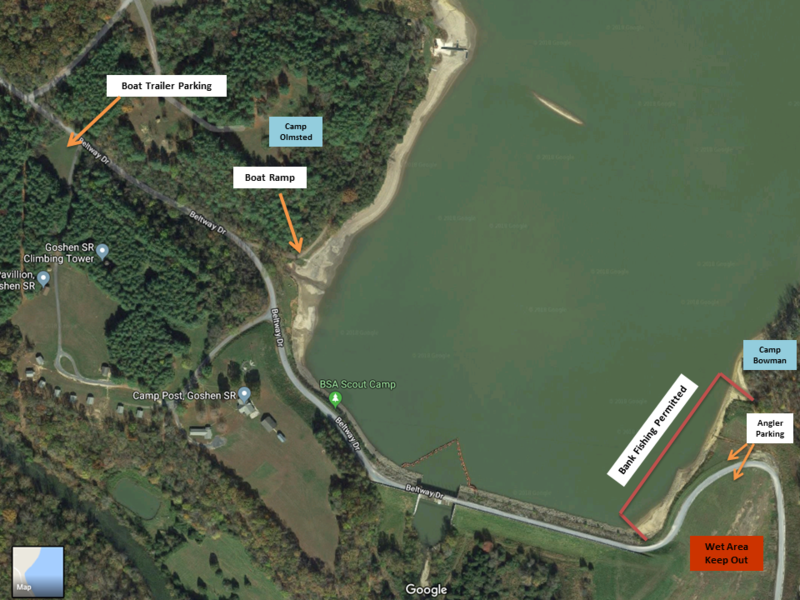 Part of the Goshen Boy Scout Reservation and made available to public access (permit required, see below) through the Public Access Lands for Sportsmen (PALS) program, Lake Merriweather is a 450 acre reservoir located in Goshen, Virginia. Black Crappie captured during spring trap netting surveys. There are a variety of sportfish to target. They include largemouth bass, black crappie, channel catfish, sunfish, and common carp. Lake Merriweather is a fairly shallow reservoir with depths averaging four feet throughout much of the lake with max depths near the dam measuring 20 feet. Anglers fishing from boats should target docks, sunken trees and stumps, and the stream channel. Woody debris scattered along the east shoreline can also be very productive. Anglers fishing from shore can only target the emergency spillway area (see map below). 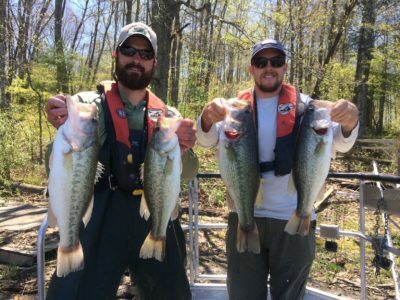 Despite the lack of shoreline access, this area holds high numbers of largemouth bass, crappie, and sunfish as well as an occasional channel catfish. Fishing is allowed from September 1 – May 31. Exception: NO FISHING the Saturday-Sunday-Monday of extended Labor Day and Memorial Day Weekends (see map and fishing regulations for specifics). Anglers are encouraged to report their catch after they are finished fishing for the day. 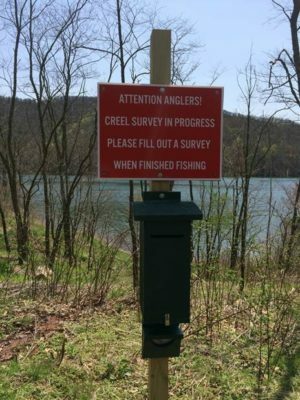 Fishing survey cards will be located at the boat launch and the bank fishing area in the emergency spillway. 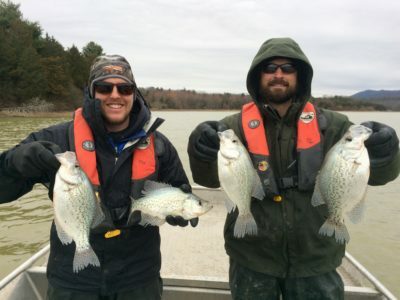 Accurately completing these surveys assist DGIF biologists with evaluating the fishery. The PALS program has opened more than 30,000 acres of private land to public use including this 2,700 acre portion of the Goshen Scout Reservation where Lake Merriweather is located. A PALS permit is required to hunt, fish, view wildlife or access the public portions of the property, in addition to all other applicable hunting or fishing licenses. Proceeds from the purchase of the PALS permit will be used for the on-going lease payment to the Boy Scouts and to provide additional public access opportunities in the future. PALS permits can be acquired through license agents or online. Largemouth Bass captured during spring electrofishing surveys. The public can launch boats during the public fishing season at Camp Olmsted near the dam. Please remember that public access is provided by an annual lease agreement with the Boy Scouts of America. We ask that you pay particular attention to the rules for hunting and fishing of the area and be respectful of the Boy Scout’s property: clean any trash that you or others have left, report any violation that you witness, and be kind and courteous to Scout employees and staff. If you have any questions about public access to the property please contact DGIF’s Region 4 Office at 540-248-9360.